Leg of lamb on Easter is about as traditional as you can get. I can’t remember an Easter without it. Most families continue having lamb on Easter. It represented a right of spring and rebirth. And it taste wonderful! We had many traditions on Easter that seem to have disappeared. We all went to church as a family, dressed in our Sunday best. All the little girls in the neighborhood wore Easter hats and white gloves with their pretty little dresses. I had on my only suite, which my mother kept in great condition. At least for as long as i could wear it and not outgrow it. My Grandfather always wore his best “Italian” suite on Sunday. And kept it on all day. That’s something we lost today. Sunday,for many of us , is no different from any other day. And that’s a shame. We walked to church, it was about 4 blocks away, at Our Lady of Guadalupe. On the walk home we would stop at the Italian bakery to pick up loafs of bread and some cookies. The end of the bread never made it home, one of us would rip it off for a snack. Back home my grandmother was preparing the leg of lamb and Easter dinner. The moment you entered the house you could smell the garlic and lamb. The end of that bread will not keep me satisfied, I thought. My father never went to church. When I asked my mother about that she would say he needed to stay home to stir the sauce. Made sense to me. We set up the dinner table in our dining room for Easter. Some Easters my aunts and uncles would join us, but this Easter it was just the immediate family. Settings around the table were for my mother and father, brother, sister, me and my grandmother and grandfather. As soon as the lamb was ready my grandmother would call down the steps for one of us to go upstairs and get the roasted lamb. My mother already prepared the manicotti and was dishing out the portions to everyone. Once the lamb arrived my grandparents came down, my grandfather with a bottle of his wine in hand, and we were ready to eat. My grandfather always sat at the head of the table, my grandmother at his side. He would make the sign of the cross and have God bless us all, and then we started to eat. Dishes rattled, extra sauce was passed around, along with the grated cheese, and we all dug into my mother’s homemade manicotti. The lamb was resting, covered in the kitchen. When the first course was finished and the last puddle of sauce was swept away on a piece of Italian bread, my mother and sister and grandmother would clear the dishes and make room for the next course. My father was carving the lamp in the kitchen and taste testing a few pieces of the succulent meat here and there. A parade of side dishes made their way to the dining room and placed around the table, roasted potatoes, sautéed broccoli , stuffed mushrooms, mixed salad, string beans and carrots in tomato sauce, and filled every nook and cranny on the table. We had to place the bottles of wine and soda and baskets of bread on the server behind us because there was not enough room. Then finally my father marched in with the carved lamb. I could see the look of anticipation on my Grandfather’s face as my father entered the room with the main course. My grandfather picked out this leg of lamb very carefully and he inspected it with his eyes to make sure my father did a good job of carving it. Without hesitation, it was placed right in front of my Grandfather, he was the first one served, always. As he was digging into the lamb all the other dishes were passed around. My grandfather also garnered the lamb bone. He loved to eat the meat off the bone. He always said, “the sweetest meat is next to the bone.” I think Louis Prima sang about that, “Closest to the bone, sweeter is the meat”. Eventually we all got the plate of lamb and picked out our slices. My mouth is watering just writing about this. Buona Pasqua! Every Easter my grandmother would prepare a leg of lamb this way. She would poke holes all over the lamb and fill each hole with a clove of garlic and parsley. She would roast the lamb with potatoes, onions and white wine. It was delicious! When you sliced the lamb you would get pieces of the garlic and parsley mixed in with the lamb. The night before you roast the lamb, prepare it this way. Place the lamb on your work surface. With a long thin knife poke a hole into the lamb about 2-3 inches deep. Push a clove of the peeled garlic into the hole with your finger. On top of that push about 3 or 4 leaves of the fresh parsley on top of the garlic into the hole. Repeat this all around the lamb, spacing the holes about 4 inches apart. If an individuale clove of garlic is too large just cut it in half. Rub the leg of lamb with olive oil, salt and pepper. Wrap the lamb in platic wrap, sealing it all around, and place it in the regridgerator over night until you are ready to roast it. This allows the flavors of the garlic and parlsey to be absorbed into the lamb. The next day in a large roasting pan, place the sliced potatoes and sliced onions in the roasting pan. Sprinkle the potatoes and onions with the minced thyme and 2 minced garlic cloves. Add a 1/4 cup olive oil to the potatoes and onions, salt and pepper and mix well with your hands. Unwrap the plastic wrap from the lamb and place the lamb into the roasting pan surrounded by the potatoes and onions. Pour the white wine over the potatoes. Roast uncovered at 400 degrees about 1 hour and 15 minutes, or until desired doneness. Turn the lamb every 15 minutes, basting with the liquid from the roasting pan. Let lamb stand 20 minutes before carving. 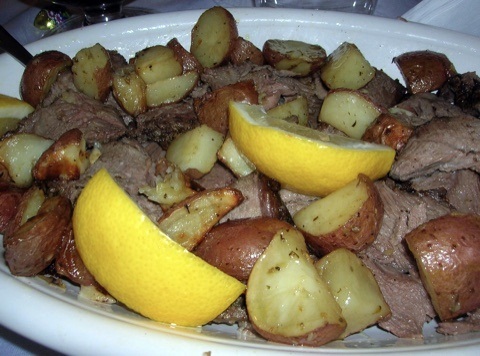 Serve the lamb garnished with the potatoes and a few wedges of lemon. This entry was posted in lamb and tagged Easter leg of lamb, lamb, leg of lamg, roast leg of lamb. Bookmark the permalink. Thank you for the trip down memory lane! I’m so sad for the children who will never have those memories. Hi Peter…..how are you?? You are truly an amazing chef!! I love all your recipes! We have to get together again!! If you are ever in the NY area let us know…..and if we have an event I will let you know!! Hopefully, we will see you soon…..
Wishing you and your family a very Happy Easter! Always a pleasure hearing from you Dianne. Stay in touch.